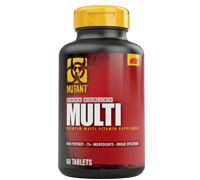 Mutant Core Series Multi is a complete nutrition insurance formula, harnessing 80+ ingredients into multiple systems, specifically formulated for the harsh realities of heavy lifting. High potency vitamins, minerals including electrolytes, phytonutrients, botanical extracts, antioxidants, enzymes, berries & greens, lipotropic factors — ALL delivered in easy to swallow tablets. Start each day with a good meal plus your Mutant Multis and you're on your way!